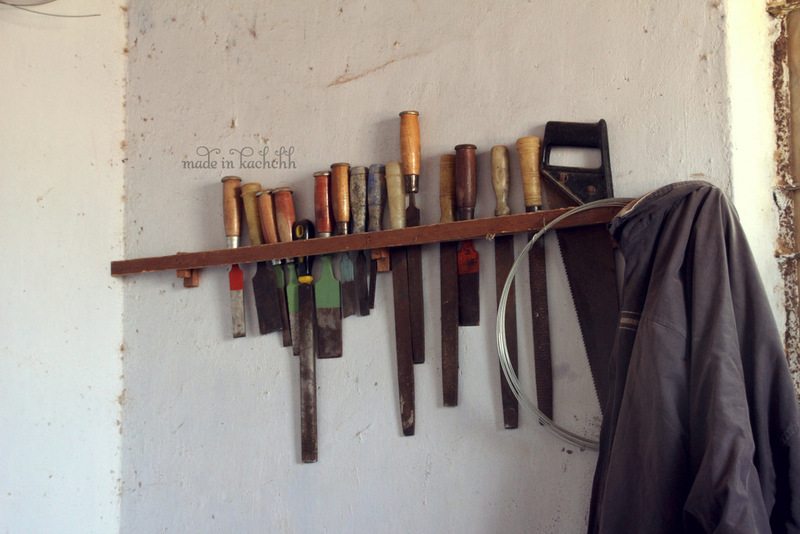 When we arrived in Ajrakhpur, Hojefa was not home … so we sat in front of his workshop. 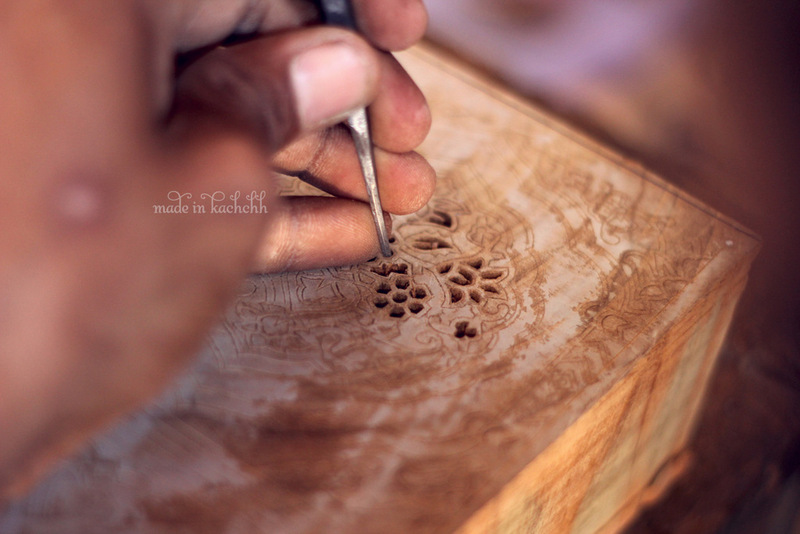 After the earthquake in 2001, a large number of workshops were built in the village to encourage the artisans to keep their craft of ‘Block Printing’, alive. They all look a bit similar : a concrete structure, flat roofs, a small sitting space in front of the entrance door and a patchwork of randomly spread colours on either side of the entrance wall, memories left by the buckets of dyes which were carried hurriedly in and out the building. But Hojefa’s entrance is different… no colours… but a layer of sawdust spread out on the ground as if an ocean of wood shaving was waiting inside for somebody to open and flow towards us. 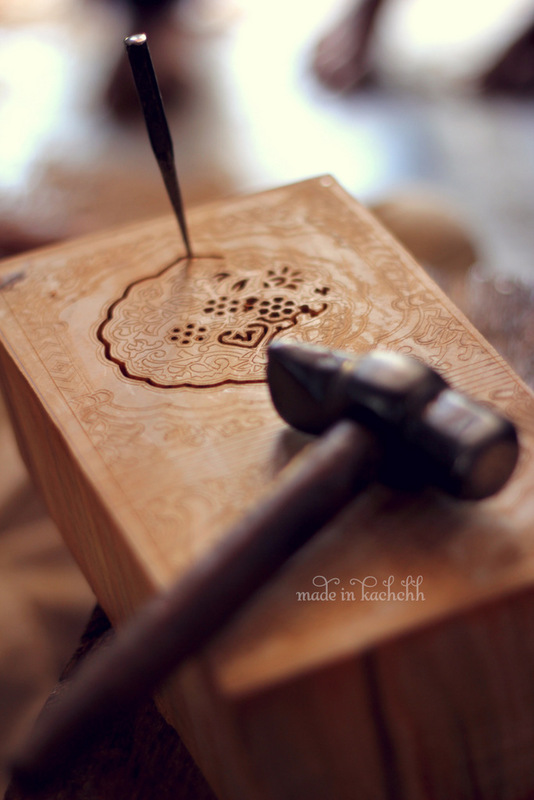 Hojefa is not a blockprinter, he is the one that makes the blocks for them! And he is the only one in Kachchh. 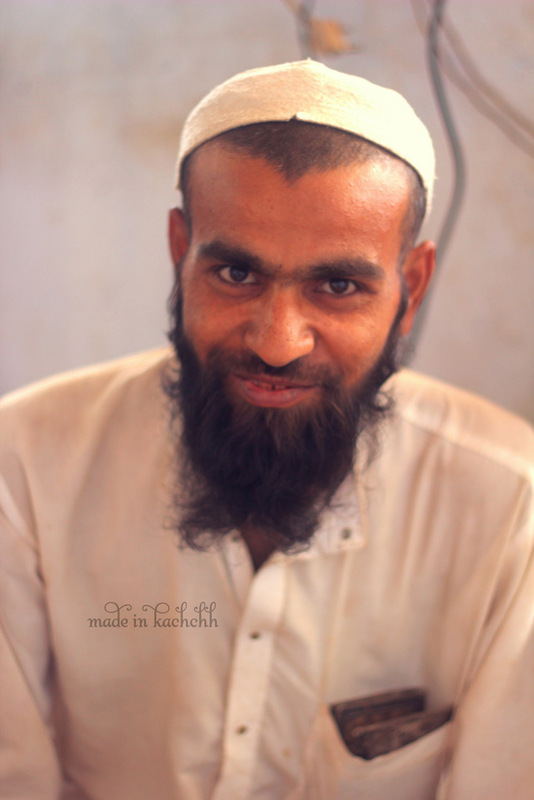 His brother, working next door, explains that Hojefa has gone to Bhuj and will be back soon. He opens the door for us, inviting us to come and sit inside. We are not welcomed by a growling wave of sawdust as I expected but by a sea of saws, wood pieces, cutters, plyers, drills, punch, lime, hammer and a multitude of unknown objects scattered all around the place.The first thought that comes to my mind is “How can u work in this chaos!” And then Hojefa arrives. He quickly cleans a small low table to make me sit. He himself sits on the floor, fitting his whole body in a square foot of cleared space. His smile makes you forget everything that is around…he is an emperor and this is his kingdom. Let’s begin!? 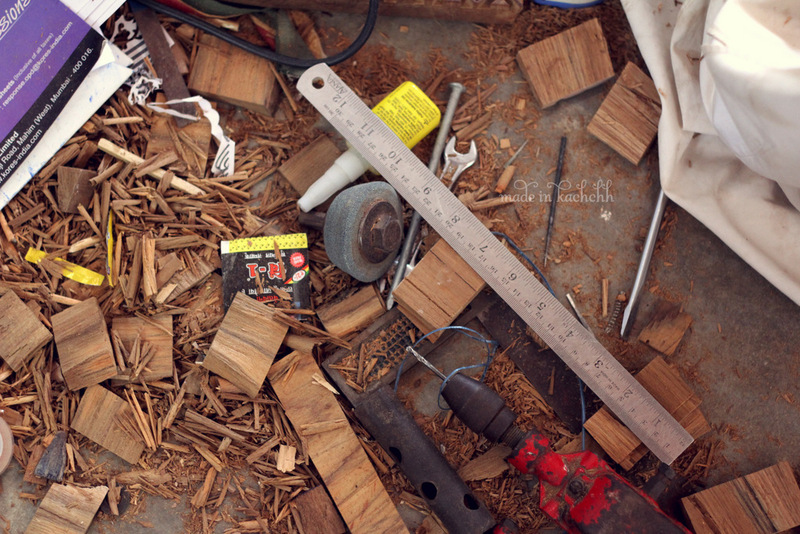 He gathers all the tools that he needs in a few seconds and spreads them on a small foot stool that he uses as a workbench. 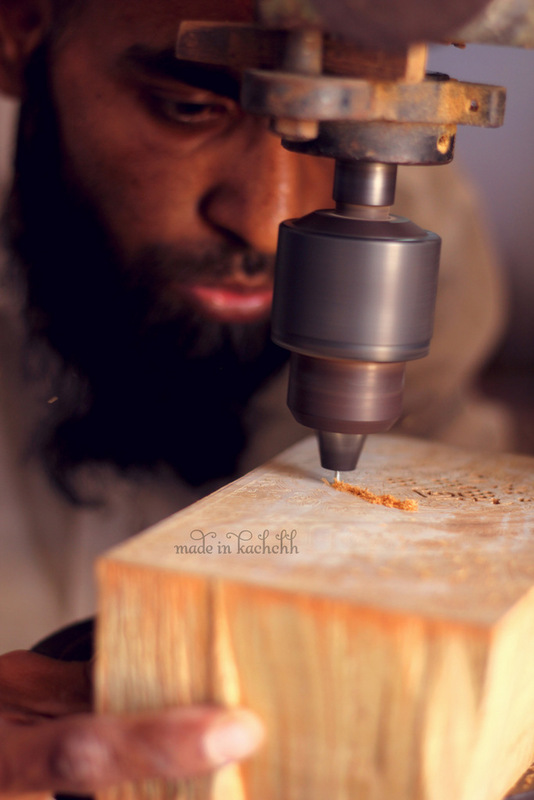 He explains that this stool was made by his dad, it has 2 small compartments to keep the smallest wood cutters and punch. 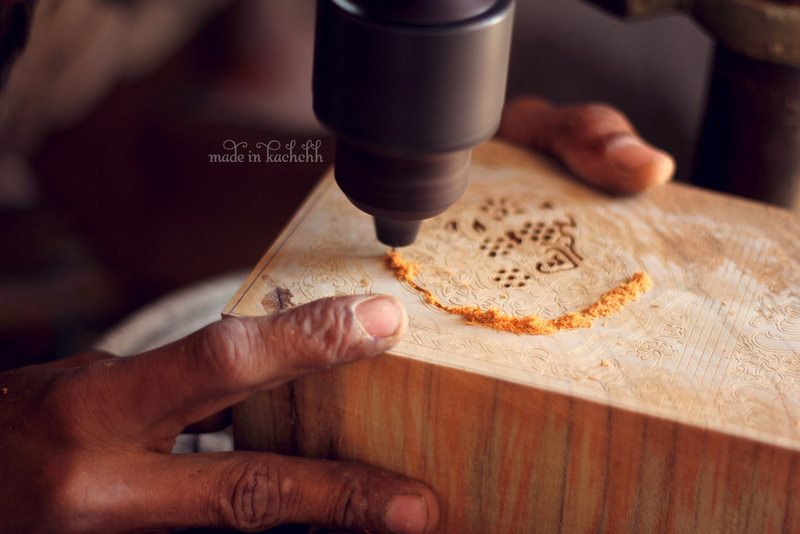 He then takes position behind his pillar drill and starts showing us how to shape a block. 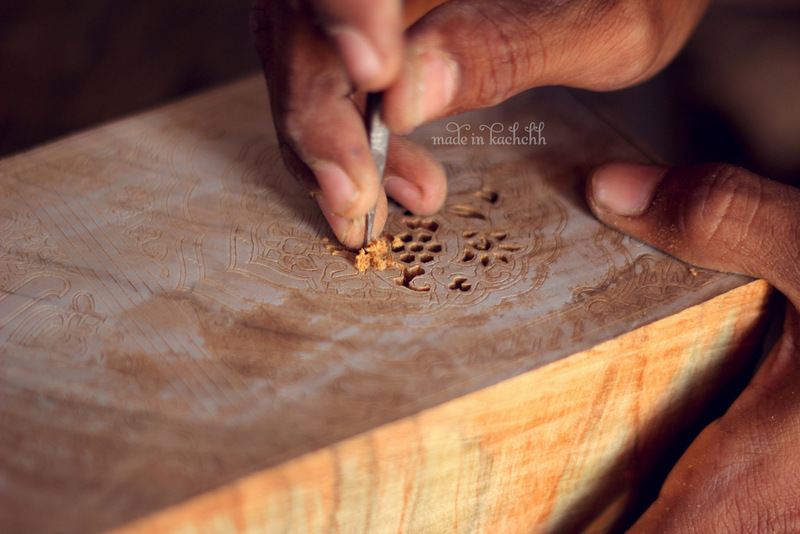 We are all fascinated by the speed at which he moves the block to carve the shape of the design he has previously marked on the piece of wood. 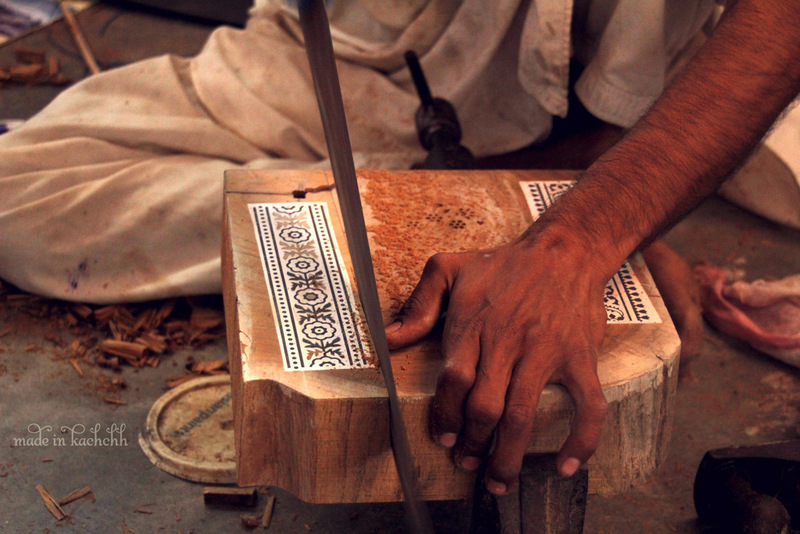 When they were not using a power drill, they used to spend up to 6 days to finish one block. Now, depending on the complexity of the design, it can take a few hours to a day. 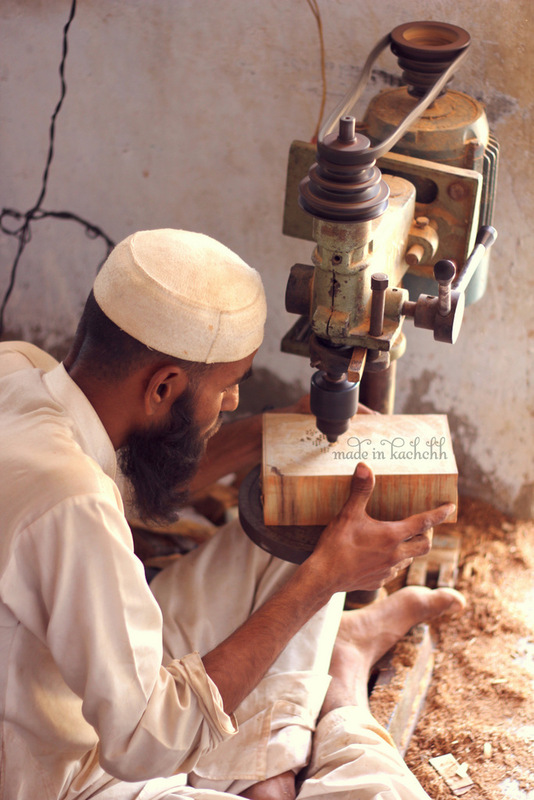 He still wants to show us how a block is made completely by hand and makes us go through the whole process. Marking. Shaping. Drilling. Cutting. 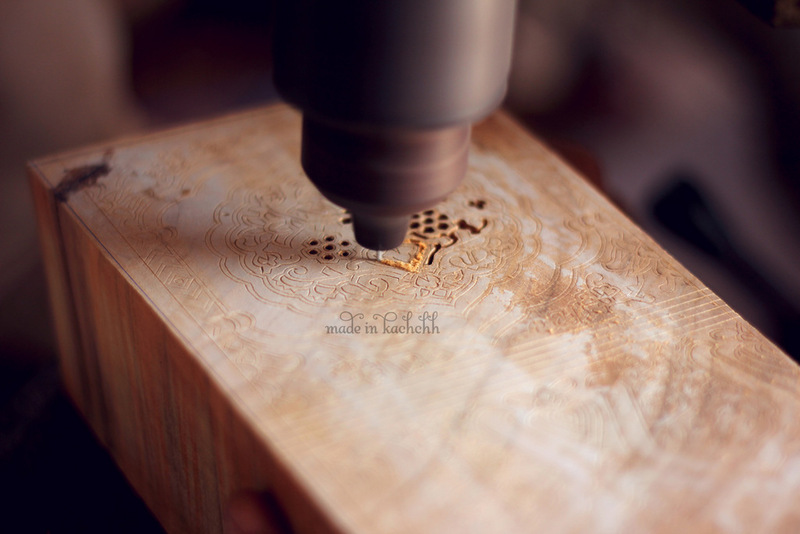 Carving and Cleaning. 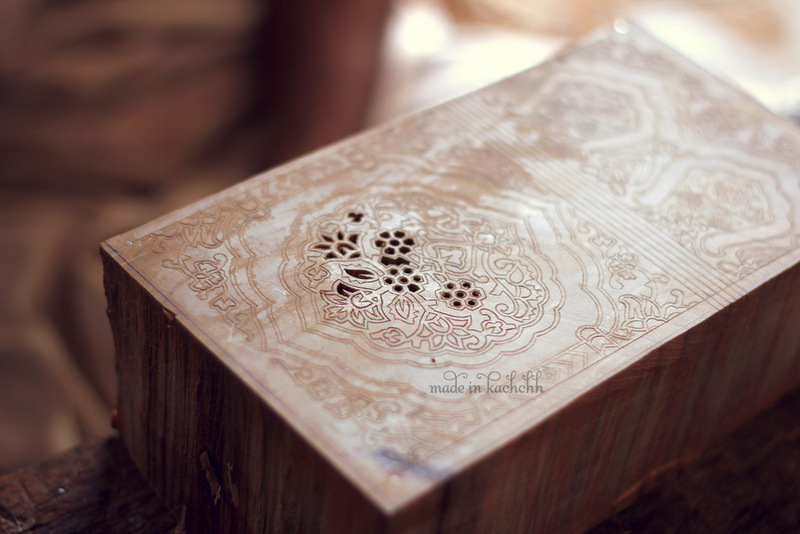 The intricacy of the design is impressive and his precision and patience to transform it into a block is mind blowing. 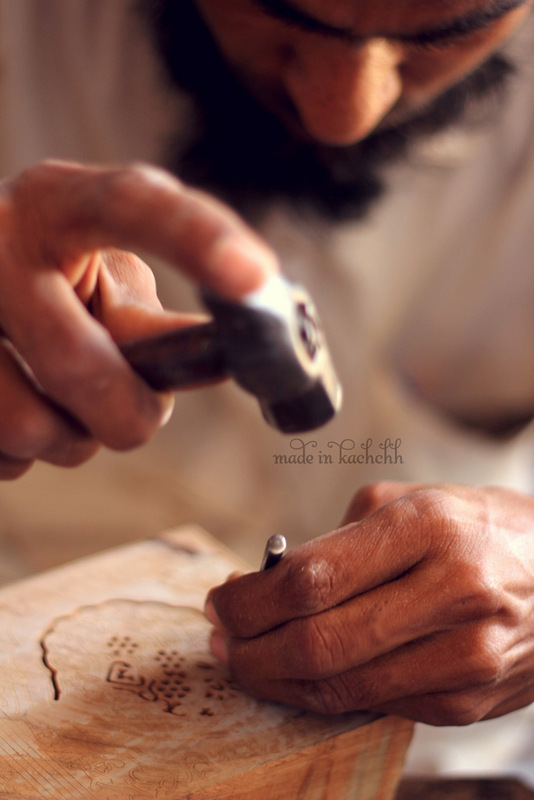 The shape that he is making will then be used to print thousands of meters of cloth, a single mistake will also be visible that many times… He is one more essential link in this fascinating chain of human skills that is block-printing. 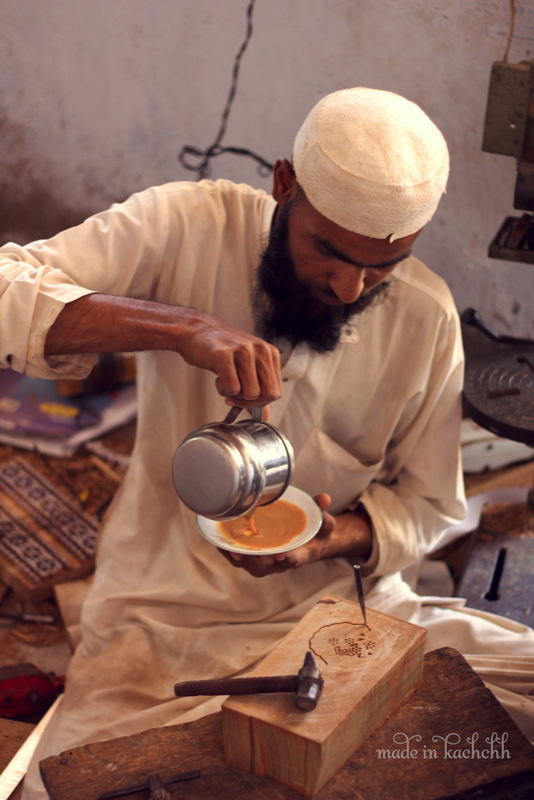 As I pick up a paper with a beautiful ajrakh pattern handdrawn on it, covered with sawdust, swimming in this workshop, I ask him, “Hosafabhai, why aren’t there more block makers like you in Kachchh?” He hands me a saucer of chai and says, ” Because you have to sit. You have to sit the whole day. Sit sit sit. Be patient. and concentrate. Sit. 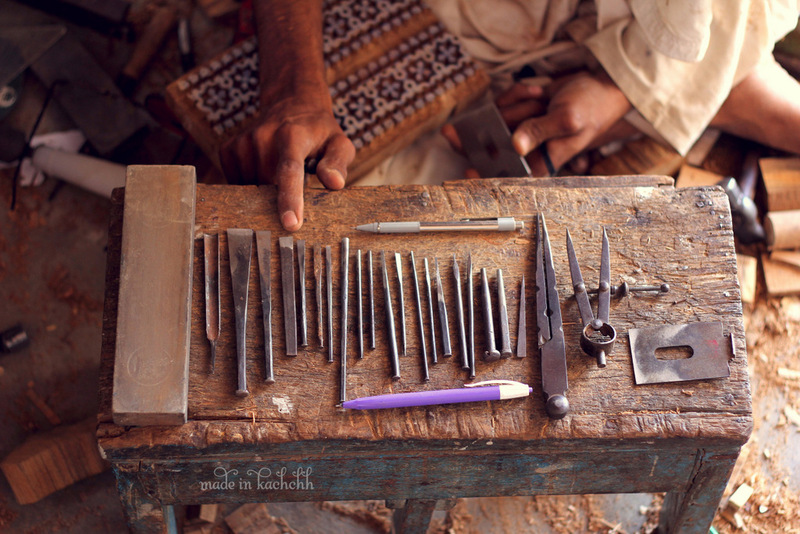 It is true that many people know how to make blocks. They have the skill. But they do not want to sit. You have to be passionate and you just have to sit.” He spends nearly 2 hours sitting with us, replying to our questions and showing us all the steps of his work. During this entire time I didn’t once think of the chaos that was surrounding us, I only saw his passion, his dexterity, his smile and the beautiful perfection of his work.